Bokeh prides itself on being a library for interactive data visualization. Using a number of examples on a real-world dataset, the goal of this tutorial is to get you up and running with Bokeh. Free Bonus: Click here to get access to a chapter from Python Tricks: The Book that shows you Python’s best practices with simple examples you can apply instantly to write more beautiful + Pythonic code. Let’s explore each step in more detail. Any good data visualization starts with—you guessed it—data. If you need a quick refresher on handling data in Python, definitely check out the growing number of excellent Real Python tutorials on the subject. This step commonly involves data handling libraries like Pandas and Numpy and is all about taking the required steps to transform it into a form that is best suited for your intended visualization. At this step, you’ll determine how you want to generate and ultimately view your visualization. In this tutorial, you’ll learn about two common options that Bokeh provides: generating a static HTML file and rendering your visualization inline in a Jupyter Notebook. From here, you’ll assemble your figure, preparing the canvas for your visualization. In this step, you can customize everything from the titles to the tick marks. You can also set up a suite of tools that can enable various user interactions with your visualization. Next, you’ll use Bokeh’s multitude of renderers to give shape to your data. Here, you have the flexibility to draw your data from scratch using the many available marker and shape options, all of which are easily customizable. This functionality gives you incredible creative freedom in representing your data. Additionally, Bokeh has some built-in functionality for building things like stacked bar charts and plenty of examples for creating more advanced visualizations like network graphs and maps. 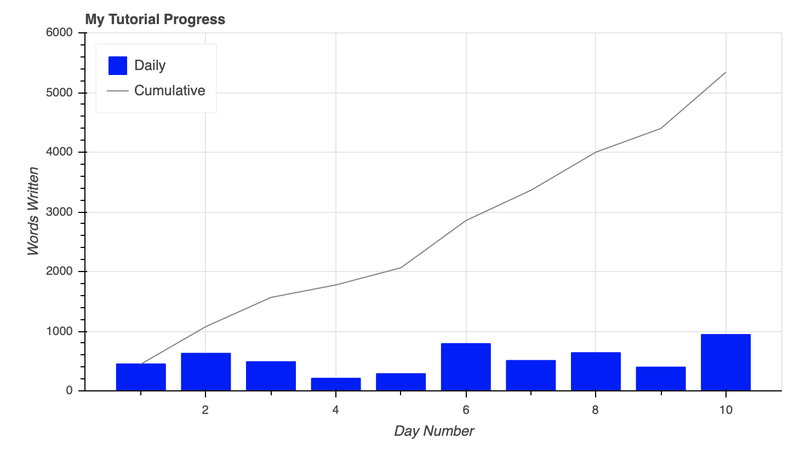 If you need more than one figure to express your data, Bokeh’s got you covered. Not only does Bokeh offer the standard grid-like layout options, but it also allows you to easily organize your visualizations into a tabbed layout in just a few lines of code. In addition, your plots can be quickly linked together, so a selection on one will be reflected on any combination of the others. Finally, it’s time to see what you created. Whether you’re viewing your visualization in a browser or notebook, you’ll be able to explore your visualization, examine your customizations, and play with any interactions that were added. If you like what you see, you can save your visualization to an image file. Otherwise, you can revisit the steps above as needed to bring your data vision to reality. Some common code snippets that are found in each step are previewed above, and you’ll see how to fill out the rest as you move through the rest of the tutorial! output_file('filename.html') will write the visualization to a static HTML file. output_notebook() will render your visualization directly in a Jupyter Notebook. It’s important to note that neither function will actually show you the visualization. That doesn’t happen until show() is called. However, they will ensure that, when show() is called, the visualization appears where you intend it to. 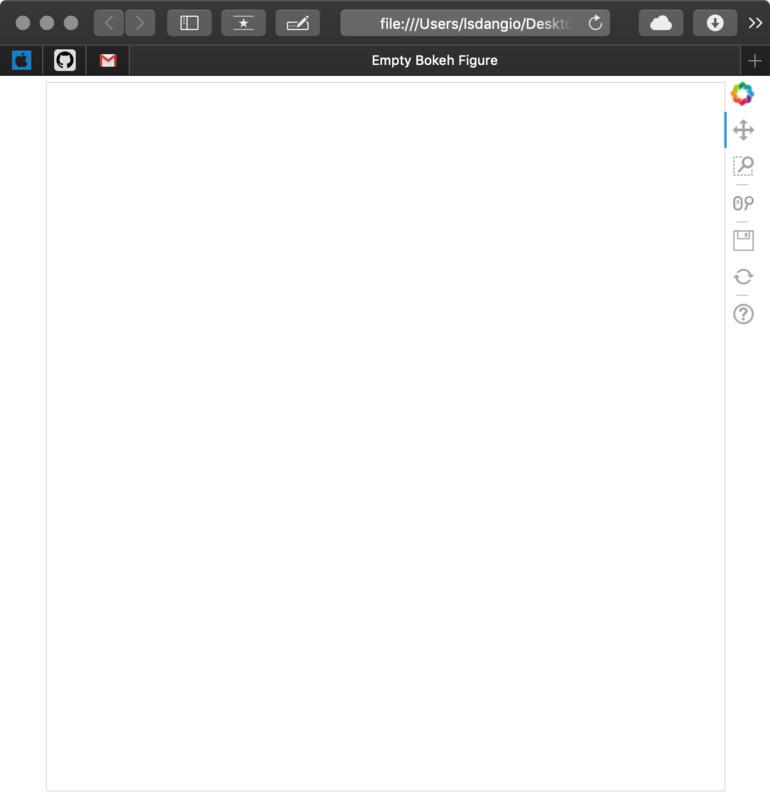 By calling both output_file() and output_notebook() in the same execution, the visualization will be rendered both to a static HTML file and inline in the notebook. However, if for whatever reason you run multiple output_file() commands in the same execution, only the last one will be used for rendering. As you can see, a new browser window opened with a tab called Empty Bokeh Figure and an empty figure. Not shown is the file generated with the name output_file_test.html in your current working directory. As you can see, the result is the same, just rendered in a different location. More information about both output_file() and output_notebook() can be found in the Bokeh official docs. Before moving on, you may have noticed that the default Bokeh figure comes pre-loaded with a toolbar. This is an important sneak preview into the interactive elements of Bokeh that come right out of the box. You’ll find out more about the toolbar and how to configure it in the Adding Interaction section at the end of this tutorial. Now that you know how to create and view a generic Bokeh figure either in a browser or Jupyter Notebook, it’s time to learn more about how to configure the figure() object. The figure() object is not only the foundation of your data visualization but also the object that unlocks all of Bokeh’s available tools for visualizing data. The Bokeh figure is a subclass of the Bokeh Plot object, which provides many of the parameters that make it possible to configure the aesthetic elements of your figure. The gridline properties are accessible via the figure’s grid attribute. In this case, setting grid_line_color to None effectively removes the gridlines altogether. More details about figure attributes can be found below the fold in the Plot class documentation. Otherwise, doing a quick web search, with the keyword bokeh and what you are trying to do, will generally point you in the right direction. The Bokeh Plot Class is the superclass of the figure() object, from which figures inherit a lot of their attributes. The Figure Class documentation is a good place to find more detail about the arguments of the figure() object. Text Properties covers all the attributes related to changing font styles, sizes, colors, and so forth. TickFormatters are built-in objects specifically for formatting your axes using Python-like string formatting syntax. Sometimes, it isn’t clear how your figure needs to be customized until it actually has some data visualized in it, so next you’ll learn how to make that happen. An empty figure isn’t all that exciting, so let’s look at glyphs: the building blocks of Bokeh visualizations. A glyph is a vectorized graphical shape or marker that is used to represent your data, like a circle or square. More examples can be found in the Bokeh gallery. After you create your figure, you are given access to a bevy of configurable glyph methods. Once your figure is instantiated, you can see how it can be used to draw the x-y coordinate data using customized circle glyphs. Marker includes shapes like circles, diamonds, squares, and triangles and is effective for creating visualizations like scatter and bubble charts. Line covers things like single, step, and multi-line shapes that can be used to build line charts. Bar/Rectangle shapes can be used to create traditional or stacked bar (hbar) and column (vbar) charts as well as waterfall or gantt charts. Information about the glyphs above, as well as others, can be found in Bokeh’s Reference Guide. To combine the columns and lines on the figure, they are simply created using the same figure() object. Additionally, you can see above how seamlessly a legend can be created by setting the legend property for each glyph. The legend was then moved to the upper left corner of the plot by assigning 'top_left' to fig.legend.location. You can check out much more info about styling legends. Teaser: they will show up again later in the tutorial when we start digging into interactive elements of the visualization. Anytime you are exploring a new visualization library, it’s a good idea to start with some data in a domain you are familiar with. The beauty of Bokeh is that nearly any idea you have should be possible. It’s just a matter of how you want to leverage the available tools to do so. This data has nothing to do with what I do for work, but I love basketball and enjoy thinking about ways to visualize the ever-growing amount of data associated with it. If you don’t have data to play with from school or work, think about something you’re interested in and try to find some data related to that. It will go a long way in making both the learning and the creative process faster and more enjoyable! This code snippet reads the data from the three CSV files and automatically interprets the date columns as datetime objects. It’s now time to get your hands on some real data. The examples above used Python lists and Numpy arrays to represent the data, and Bokeh is well equipped to handle these datatypes. However, when it comes to data in Python, you are most likely going to come across Python dictionaries and Pandas DataFrames, especially if you’re reading in data from a file or external data source. Bokeh is well equipped to work with these more complex data structures and even has built-in functionality to handle them, namely the ColumnDataSource. 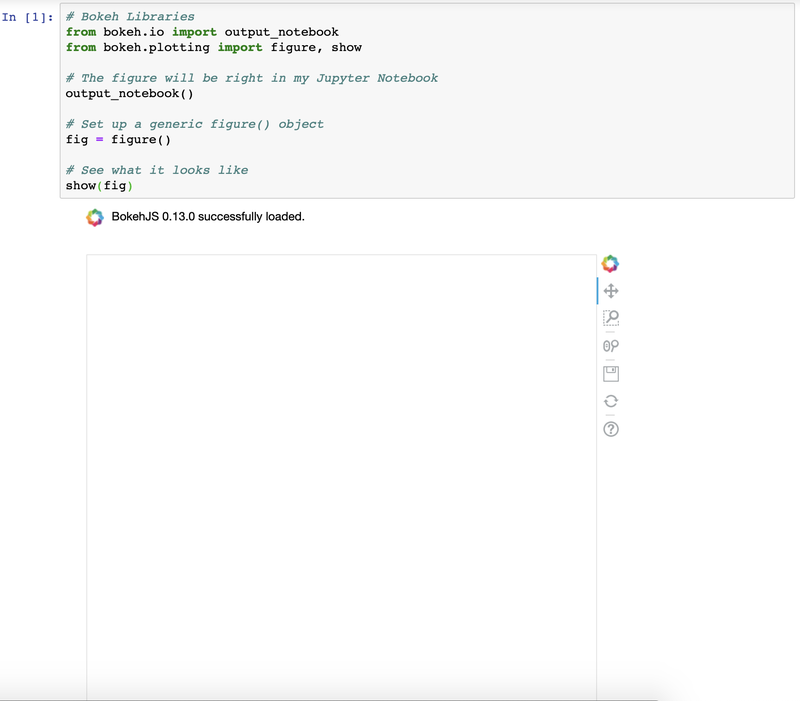 For one, whether you reference a list, array, dictionary, or DataFrame directly, Bokeh is going to turn it into a ColumnDataSource behind the scenes anyway. More importantly, the ColumnDataSource makes it much easier to implement Bokeh’s interactive affordances. The ColumnDataSource is foundational in passing the data to the glyphs you are using to visualize. Its primary functionality is to map names to the columns of your data. This makes it easier for you to reference elements of your data when building your visualization. It also makes it easier for Bokeh to do the same when building your visualization. Python dict: The keys are names associated with the respective value sequences (lists, arrays, and so forth). Pandas DataFrame: The columns of the DataFrame become the reference names for the ColumnDataSource. Pandas groupby: The columns of the ColumnDataSource reference the columns as seen by calling groupby.describe(). Notice how the respective ColumnDataSource objects are referenced when creating the two lines. You simply pass the original column names as input parameters and specify which ColumnDataSource to use via the source property. 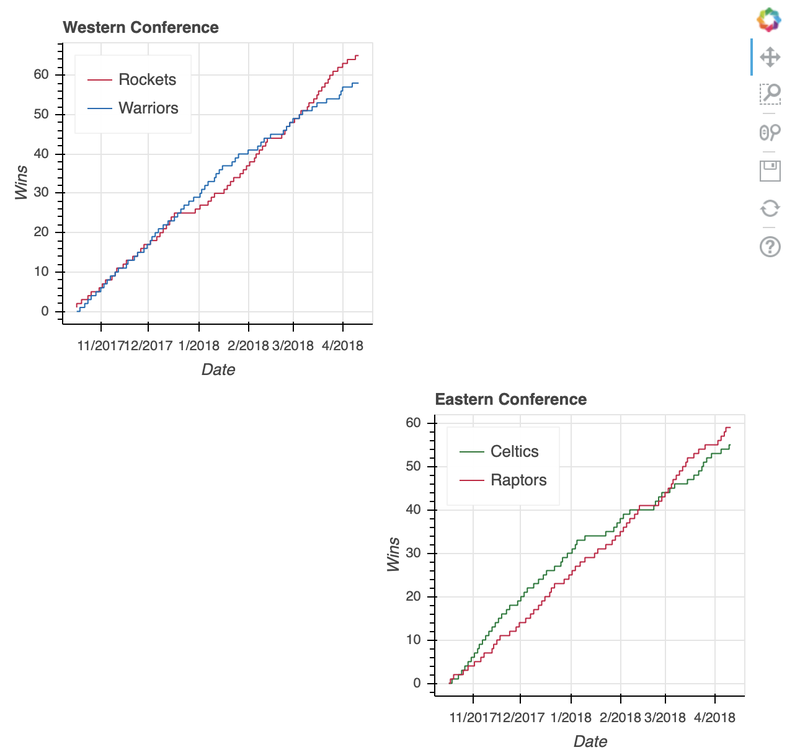 The visualization shows the tight race throughout the season, with the Warriors building a pretty big cushion around the middle of the season. However, a bit of a late-season slide allowed the Rockets to catch up and ultimately surpass the defending champs to finish the season as the Western Conference number-one seed. Note: In Bokeh, you can specify colors either by name, hex value, or RGB color code. For the visualization above, a color is being specified for the respective lines representing the two teams. Instead of using CSS color names like 'red' for the Rockets and 'blue' for the Warriors, you might have wanted to add a nice visual touch by using the official team colors in the form of hex color codes. Alternatively, you could have used tuples representing RGB color codes: (206, 17, 65) for the Rockets, (0, 107, 182) for the Warriors. Bokeh provides a helpful list of CSS color names categorized by their general hue. Also, htmlcolorcodes.com is a great site for finding CSS, hex, and RGB color codes. Notice how the GroupFilter is passed to CDSView in a list. This allows you to combine multiple filters together to isolate the data you need from the ColumnDataSource as needed. For information about integrating data sources, check out the Bokeh user guide’s post on the ColumnDataSource and other source objects available. The Western Conference ended up being an exciting race, but say you want to see if the Eastern Conference was just as tight. Not only that, but you’d like to view them in a single visualization. This is a perfect segue to the next topic: layouts. The Eastern Conference standings came down to two rivals in the Atlantic Division: the Boston Celtics and the Toronto Raptors. Before replicating the steps used to create west_top_2, let’s try to put the ColumnDataSource to the test one more time using what you learned above. The ColumnDataSource was able to isolate the relevant data within a 5,040-by-39 DataFrame without breaking a sweat, saving a few lines of Pandas code in the process. 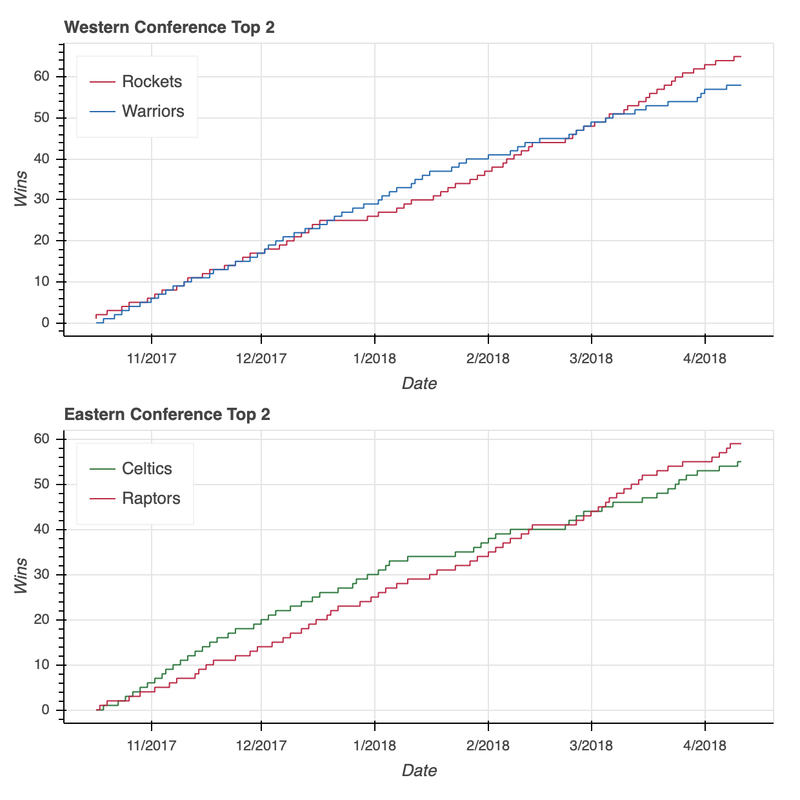 Looking at the visualization, you can see that the Eastern Conference race was no slouch. After the Celtics roared out of the gate, the Raptors clawed all the way back to overtake their division rival and finish the regular season with five more wins. With our two visualizations ready, it’s time to put them together. Similar to the functionality of Matplotlib’s subplot, Bokeh offers the column, row, and gridplot functions in its bokeh.layouts module. These functions can more generally be classified as layouts. I’ll save you the two lines of code, but rest assured that swapping column for row in the snippet above will similarly configure the two plots in a horizontal configuration. This is one of many errors that are part of Bokeh’s validation module, where w-1004 in particular is warning about the re-use of west_fig and east_fig in a new layout. # Layout code snippet goes here! Doing so will renew the relevant components to render the visualization, ensuring that no warning is needed. Instead of using column or row, you may want to use a gridplot instead. One key difference of gridplot is that it will automatically consolidate the toolbar across all of its children figures. The two visualizations above do not have a toolbar, but if they did, then each figure would have its own when using column or row. With that, it also has its own toolbar_location property, seen below set to 'right'. If you’d rather toggle between both visualizations at their full size without having to squash them down to fit next to or on top of each other, a good option is a tabbed layout. The first step is to create a Panel() for each tab. That may sound a little confusing, but think of the Tabs() function as the mechanism that organizes the individual tabs created with Panel(). 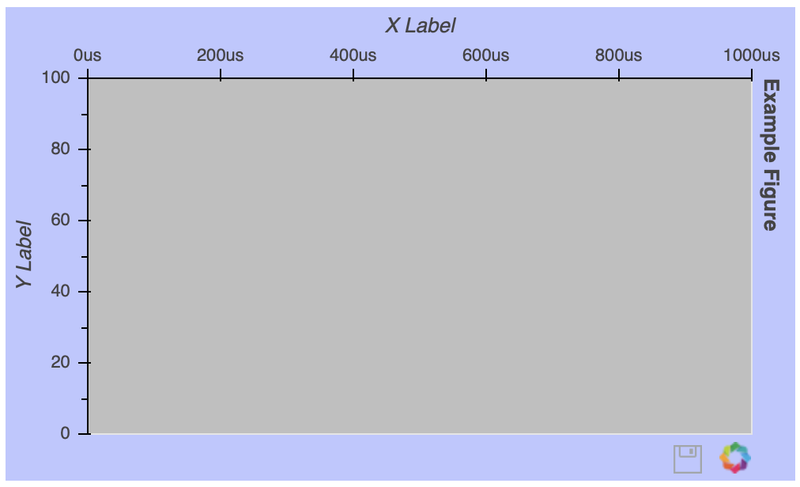 Each Panel() takes as input a child, which can either be a single figure() or a layout. 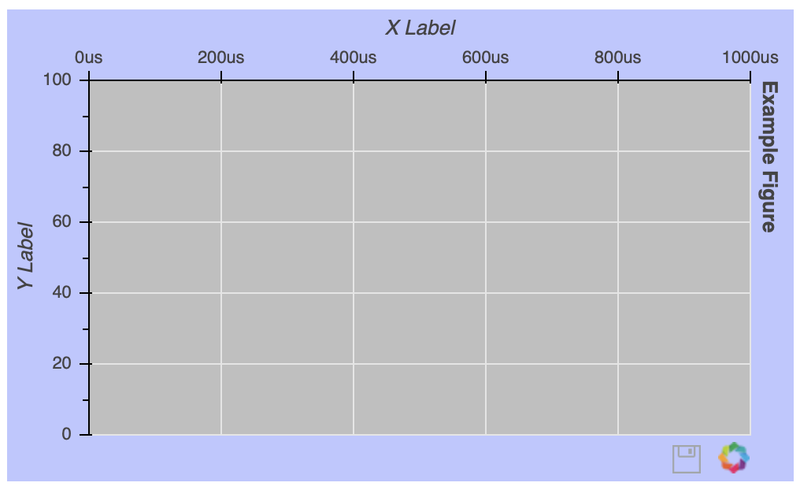 (Remember that a layout is a general name for a column, row, or gridplot.) Once your panels are assembled, they can be passed as input to Tabs() in a list. Now that you understand how to access, draw, and organize your data, it’s time to move on to the real magic of Bokeh: interaction! As always, check out Bokeh’s User Guide for more information on layouts. Implementing these interactive elements open up possibilities for exploring your data that static visualizations just can’t do by themselves. The toolbar can be removed by passing toolbar_location=None when instantiating a figure() object, or relocated by passing any of 'above', 'below', 'left', or 'right'. To geek out on tools , make sure to visit Specifying Tools. Otherwise, they’ll be illustrated in covering the various interactions covered herein. Implementing selection behavior is as easy as adding a few specific keywords when declaring your glyphs. The next example will create a scatter plot that relates a player’s total number of three-point shot attempts to the percentage made (for players with at least 100 three-point shot attempts). First, specify the selection tools you want to make available. In the example above, 'box_select', 'lasso_select', 'poly_select', and 'tap' (plus a reset button) were specified in a list called select_tools. When the figure is instantiated, the toolbar is positioned 'below' the plot, and the list is passed to tools to make the tools selected above available. For even more information about what you can do upon selection, check out Selected and Unselected Glyphs. The HoverTool() is slightly different than the selection tools you saw above in that it has properties, specifically tooltips. Notice the addition of the Hover button to the toolbar, which can be toggled on and off. This is done by creating a completely new glyph, in this case circles instead of squares, and assigning it to hover_glyph. Note that the initial opacity is set to zero so that it is invisible until the cursor is touching it. The properties that appear upon hover are captured by setting hover_alpha to 0.5 along with the hover_fill_color. To further explore the capabilities of the HoverTool(), see the HoverTool and Hover Inspections guides. Linking is the process of syncing elements of different visualizations within a layout. For instance, maybe you want to link the axes of multiple plots to ensure that if you zoom in on one it is reflected on another. Let’s see how it is done. For this example, the visualization will be able to pan to different segments of a team’s schedule and examine various game stats. 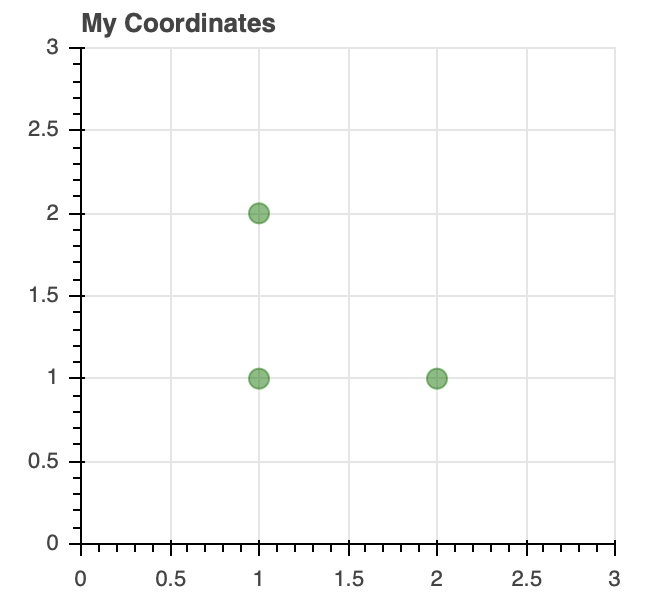 Each stat will be represented by its own plot in a two-by-two gridplot() . For this use case, a list specifying the categorical data values to be mapped is passed to factors and a list with the intended colors to palette. For more on the CategoricalColorMapper, see the Colors section of Handling Categorical Data on Bokeh’s User Guide. As you can see, the only parameters that needed to be adjusted were the y-axis-label of the figure and the data that will dictate top in the vbar. These values were easily stored in a dict that was iterated through to create the figures for each stat. You can also see the implementation of the CategoricalColorMapper in the configuration of the vbar glyph. The color property is passed a dict with the field in the ColumnDataSource to be mapped and the name of the CategoricalColorMapper created above. The initial view will only show the first 10 games of the 76ers’ season, so there needs to be a way to pan horizontally to navigate through the rest of the games in the season. Thus configuring the toolbar to have an xpan tool allows panning throughout the plot without having to worry about accidentally skewing the view along the vertical axis. Similarly you can easily implement linked selections, where a selection on one plot will be reflected on others. To see how this works, the next visualization will contain two scatter plots: one that shows the 76ers’ two-point versus three-point field goal percentage and the other showing the 76ers’ team points versus opponent points on a game-by-game basis. The goal is to be able to select data points on the left-side scatter plot and quickly be able to recognize if the corresponding datapoint on the right scatter plot is a win or loss. This is a great illustration of the power in using a ColumnDataSource. As long as the glyph renderers (in this case, the circle glyphs for the percentages, and square glyphs for the wins and losses) share the same ColumnDataSource, then the selections will be linked by default. By selecting a random sample of data points in the upper right quadrant of the left scatter plot, those corresponding to both high two-point and three-point field goal percentage, the data points on the right scatter plot are highlighted. Similarly, selecting data points on the right scatter plot that correspond to losses tend to be further to the lower left, lower shooting percentages, on the left scatter plot. All the details on linking plots can be found at Linking Plots in the Bokeh User Guide. That brings us to the final interactivity example in this tutorial: interactive legends. In the Drawing Data With Glyphs section, you saw how easy it is to implement a legend when creating your plot. With the legend in place, adding interactivity is merely a matter of assigning a click_policy. Using a single line of code, you can quickly add the ability to either hide or mute data using the legend. In this example, you’ll see two identical scatter plots comparing the game-by-game points and rebounds of LeBron James and Kevin Durant. The only difference will be that one will use a hide as its click_policy, while the other uses mute. Note that mute_fig has an extra parameter called muted_alpha. This parameter controls the opacity of the markers when mute is used as the click_policy. Once the legend is in place, all you have to do is assign either hide or mute to the figure’s click_policy property. This will automatically turn your basic legend into an interactive legend. Also note that, specifically for mute, the additional property of muted_alpha was set in the respective circle glyphs for LeBron James and Kevin Durant. This dictates the visual effect driven by the legend interaction. For more on all things interaction in Bokeh, Adding Interactions in the Bokeh User Guide is a great place to start. Congratulations! You’ve made it to the end of this tutorial. You should now have a great set of tools to start turning your data into beautiful interactive visualizations using Bokeh. To explore even more of what Bokeh is capable of, the official Bokeh User Guide is an excellent place to dig into some more advanced topics. I’d also recommend checking out Bokeh’s Gallery for tons of examples and inspiration. Original article title: Interactive Data Visualization in Python With Bokeh. This full article can be read at: Interactive Data Visualization in Python With Bokeh.